Manchester City Council has secured £2.87m of grant funding from the Government’s national Heat Network Investment Project, for the Manchester Civic Quarter Heat Network. Manchester is one of only nine local authorities to have won funding for their projects. The funding success advances the project, which will deliver significant carbon reductions over three decades. Following the grant success, the council will meet the remainder of the programme investment. The project will become cost-neutral over the course of the scheme, with the potential to generate revenue to fund future low-carbon, renewable initiatives. The scheme has been designed with expansion in mind and as the network grows and more customers are connected, further capacity can be installed and the benefits increased. Vital Energi, who are one of the country’s best known providers of sustainable and renewable energy schemes, have been appointed as preferred bidder to deliver the scheme, which will include the creation of a low-carbon energy centre and 2km district heating network - connecting several iconic Manchester buildings, including Manchester Town Hall & Extension, Manchester Central Convention Centre, Central Library, Manchester Art Gallery, The Bridgewater Hall, and Heron House. Councillor Angeliki Stogia, Manchester City Council’s Executive Member for the Environment and Skills, said: “This is a fantastic opportunity for Manchester to not only reduce energy costs and carbon emissions within the civic estate, but also to offer those same environmental and financial benefits to local businesses. The scheme will be powered from an energy centre which includes two 2.7MWe Combined Heat& Power units. Heat created during electricity generation will be distributed through a highly efficient underground network of insulated pipes. The electrical power generated will be distributed to buildings connected to the heat supply. All carbon and financial savings are guaranteed by Vital Energi under a 30-year energy performance contract, which will also see them perform operations and maintenance responsibilities for the duration of the contract. The project, which includes a 40m flue, will be a permanent addition to Manchester’s skyline and four of the UK’s most renowned architecture practices were shortlisted to submit designs as part of a competition to ensure the energy centre would be a positive addition to Manchester’s Civic Quarter. After presentations were made to a panel made up of council representatives and relevant experts, the design by award-winning architects Tonkin Liu and structural engineers Arup was chosen. 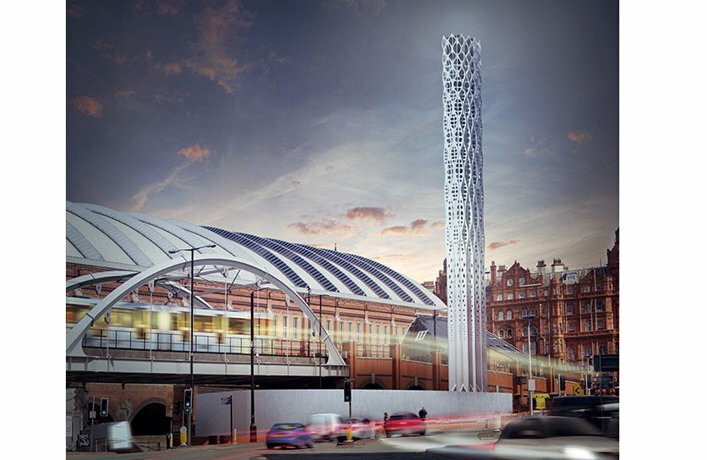 The project team will now work closely with the team to deliver this stunning design, named the Tower of Light. A final report will be heard by Manchester City Council’s Executive in the New Year and works are expected to start in spring 2018.